Functional, yet attractive - scroll down to view our fabric covering color options. AVInteriors will help you with common sense panel applications that will vastly improve your sound system's performance - plus add stylish decor to your room. Our product experts are also able to help you with more sophisticated room treatment analysis and improved sound recommendations, including much better bass response. Let us help you easily eliminate two of the most common "first reflection" problems with home theater acoustics - "slap back" reflections off the back wall of your room, plus side wall reflections. These are fairly simple to tackle and we can help "do it yourselfers" take on room acoustics and make it look great in the process! 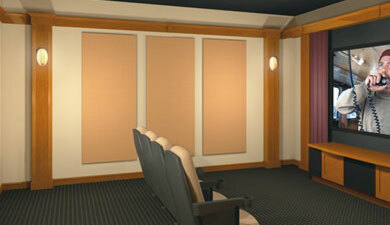 CineCoustic™ Fabric Acoustic Panels - call for quantity package deals , custom and large sizes. 1 and 2 Inch Deep Fiberglass Panels with Resin Reinforced Edges and Designer Fabric - our low discount prices include metal impaler clips with permanent adhesive, but instead, we can include permanent adhesive along with a quick set spray adhesive to make mounting easy, if preferred. As these are custom manufactured products, pre-payment is required and there are no returns for refund or exchange. The pricing on our purchase buttons is for credit card purchases - contact us or call toll free #866-243-1001 for larger package deals and for pay by check discounts. The panels take about 2 weeks to manufacture for smaller orders and 2 to 3 weeks (or more) for larger orders - contact us for production times. Lance has over 33 years in consumer electronics, has designed many high end home theaters, has trained custom installation salespeople and technicians, plus has completed advanced training in THX room setup and room acoustic solutions at Lucasfilm's Skywalker Ranch. We also have one of the most experienced expert acoustical design consultants available for larger and more complex jobs, plus sophisticated commercial projects. 2 ft x 2 ft x 1" D 24" 24"
2 ft x 3 ft x 1" D 24" 36"
2 ft x 4 ft x 1" D 24" 48"
3 ft x 3 ft x 1" D 36" 36"
2 ft x 2 ft x 2" D 24" 24"
2 ft x 3 ft x 2" D 24" 36"
2 ft x 4 ft x 2" D 24" 48"
3 ft x 3 ft x 2" D 36" 36"
Note: Colors will vary from screen to screen, call us for actual fabric swatch samples for an exact color match - 866-243-1001. Normally, these products take 2 to 3 weeks to ship out. Contact us for specifics.